I do apologise for the lack of posts this week. I had hoped to get some painting done during my extended weekend, but this didn't happen as I was feeling somewhat under the weather. Not ill, just a little bit off, enough to not feel like painting anything. I did pick up my brushes, but that was to clean them. I have been feeling fully recovered since Wednesday morning, but I still haven't done any painting. There is a reason for that. Ian and maybe some others might have guessed where this post is going from the title. You see, a good few years ago I bought a book. And then I bought all the following book in the series. In March I finally found out that the paperback version of the 14th and final book in the series was out and snapped it up. Yes, you did read that right - the fourteenth and final book. It turns out it had actually been published in paperback several months before, but I'd never seen it on the shelves of any bookshops I browse in until March. It has been a long and bumpy ride with one moment that set all the fans into a panic. For those of you who don't know by now what I'm talking about, the books are the Wheel of Time series by Robert Jordan. The panic moment was that he died in 2007 with the final book still to come. Fortunately before his death, Mr Jordan had sketched out (in quite some detail) "A Memory of Light". His widow found a great young author, Brandon Sanderson, to complete the series. However, it soon became clear that the final volume was too much for one book or even two books (most of the books are about 900 pages long). 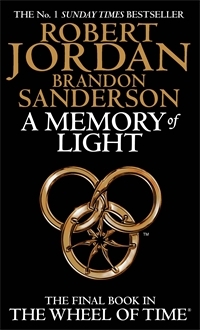 Thus "A Memory of Light" ended up as three books - The Gathering Storm, The Towers of Midnight and A Memory of Light. Luckily for the fans, Mr Sanderson has done a superb job of these books. And now we return to the reason for me not having done any painting over the last few days (and probably not this weekend either!). Over the past few months I have been re-reading the series from the start. On Tuesday evening I finished reading the 13th book. I couldn't resist starting A Memory of Light and proceeded to read the Prologue. I had a major nerdgasm just from reading the prologue and have been in nerdgasm territory ever since then. I'm currently about two thirds of the way through and finding it very hard to pull myself away from reading. I should finish it this weekend. Ohmydog! I've just realised I probably won't finish it this weekend as on Sunday I'll be out for most of the day doing a big FoG game of Tannenberg. Once the book is finished I will get back to painting. The moment you've all been waiting for is here. Pics of the finished Jazz Band. These were great fun to paint - I can't wait for the next "special" for this project. Having gone all the way through spraying with matt varnish then touching up parts with gloss and satin varnish for the cops, G-Men and gangsters, I had a horrible thought a couple of nights ago. Part of my plan is to use these for participation games, so they'll probably get handled quite a lot. Will the spray varnish be enough to keep the paint jobs safe from handling? Discretion being the better part of valour, I decided to play it safe and give them a coat of Klear. Of course, this means that I'll have to go back and repeat the matt spray and brush-on gloss/satin for the 36 figures I've completed so far. 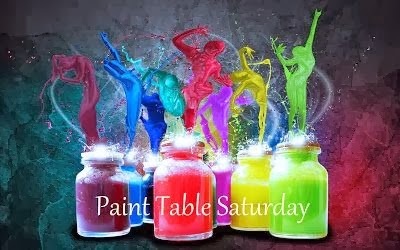 Well, what's on my paint table today? The Jazz Band are almost done now - just metal highlights left to do and the "stage" part of the base. They will get a coat of Klear as well. Tomorrow I will start work on some collateral damage civilians for gaming. As there are twenty figures in that pack from Blue Moon, I've split them into two groups - male and female. A while back Fran and Ray were asking where their "molls" were, so I'll do the ladies first. I'm also hoping to finish the corner store and warehouse this weekend (it's a long one for me - I've booked Monday and Tuesday off work!). I might also make up a stage for the band to perform on.